Does the world need another bike blog? To start with this, then, probably my favourite bike, out of the four I currently own. I also have one lodger, my daughter’s old Raleigh something or other, built up fixed, and actually, quite a nice little ride. But as she now resides in quite a hilly part of Scotland, it wasn’t getting much use. So, it swapped places with my old Orbit Romany which owns a few gears. Most ordinary mortals need gears to get up and down hills, although I do have at least a couple of cycling friends who manage without. My daughter, though extremely fit and strong, is still an ordinary mortal and prefers, for example, riding the Lecht, or up the Cairngorm road, without risking a burst lung. So she took the Orbit, a gold coloured, perfectly serviceable, tough, touring bike I had acquired second hand several years before. And I finally had the excuse I needed (and eventually enough cash) to replace it with the handbuilt, individually sized, beauty above. For, my partner’s rule in this house is, new bike in means at least one bike out. (I cheated, however, as a few weeks later my daughter’s fixed turned up to sit in her bedroom for her use when in London. But, ssshhh! I’m not sure he has sussed that sneaky move yet). 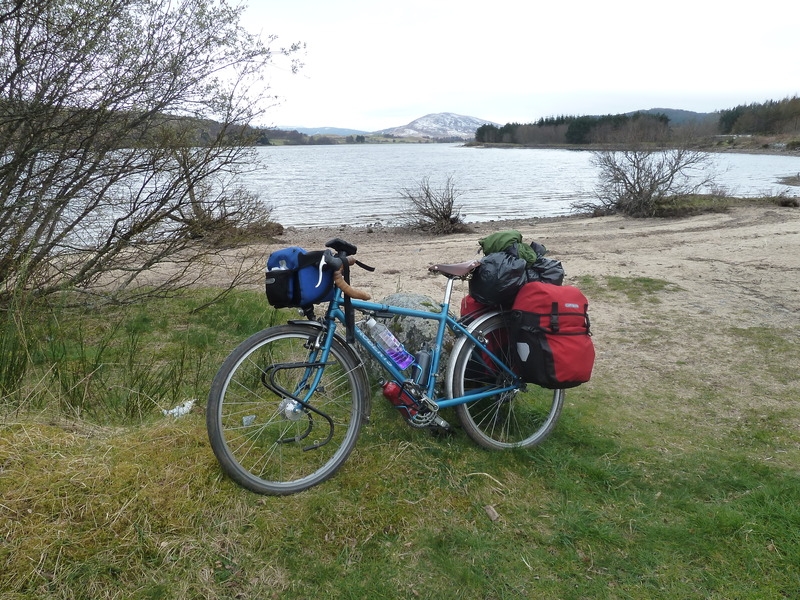 And the bike I eventually brought in, the bike standing proud by Loch Rannoch in all its cyclecamping glory? It’s a Roberts. Their Roughstuff model. Built to haul tons of gear up hills and over tracks, slowly, it’s true, but all the better to experience the world as you ride by. It has become, my favourite bike. And, if you are disposed to check this blog from time to time, you will probably find out why.